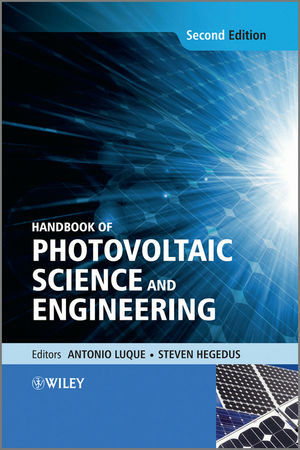 Fully revised and updated, the Handbook of Photovoltaic Science and Engineering, Second Edition incorporates the substantial technological advances and research developments in photovoltaics since its previous release. All topics relating to the photovoltaic (PV) industry are discussed with contributions by distinguished international experts in the field. photovoltaic system installation and operation of components such as inverters and batteries. Each chapter is structured to be partially accessible to beginners while providing detailed information of the physics and technology for experts. Encompassing a review of past work and the fundamentals in solar electric science, this is a leading reference and invaluable resource for all practitioners, consultants, researchers and students in the PV industry. Antonio Luque became a full professor of Electronics at the University of Madrid in 1970 and soon became head of the Semiconductor Laboratory (now the Institute for Solar Energy). Isofoton, the 8th world producer of solar cell, was founded on Antonio's invention of the Bifacial Cell. He has worked with BP Solar and British Petroleum (the EUCLIDES program) on solar concentrators to the point where it is near to commercial viability, and has received many national and international prizes and rewards during the course of his career, including the National Prize for Technological Research and the Jaime I medal. Professor Luque is also the author of numerous publications. Steven Hegedus was appointed Fellow in the University of Delaware's Center for Energy and Environmental Policy in 2005. He has worked as a Semiconductor Device Engineer for IBM Corporation in New York, modeling, testing and designing analog and digital integrated circuit devices. At IBM he designed and tested a new stress-independent integrated Hall effect sensor. He later became a research associate at the Institute of Energy Conversion, University of Delaware. Dr Hegedus is a Professional member of the American Solar Energy Society and a Lifetime member of the American Physical Society, as well as a member of the Union of Concerned Scientists. 1 Achievements and Challenges of Solar Electricity from Photovoltaics (Steven Hegedus and Antonio Luque). 2 The Role of Policy in PV Industry Growth: Past, Present and Future (John Byrne and Lado Kurdgelashvili). 2.2 Policy Review of Selected Countries. 2.3 Policy Impact on PV Market Development. 2.4 Future PV Market Growth Scenarios. 2.5 Toward a Sustainable Future. 3 The Physics of the Solar Cell (Jeffery L. Gray). 3.2 Fundamental Properties of Semiconductors. 4 Theoretical Limits of Photovoltaic Conversion and New-generation Solar Cells (Antonio Luque and Antonio Martı). 4.4 The Technical Efficiency Limit for Solar Converters. 5 Solar Grade Silicon Feedstock (Bruno Ceccaroli and Otto Lohne). 5.3 Production of Silicon Metal/Metallurgical Grade Silicon. 5.4 Production of Polysilicon/Silicon of Electronic and Photovoltaic Grade. 5.5 Current Silicon Feedstock to Solar Cells. 5.6 Requirements of Silicon for Crystalline Solar Cells. 5.7 Routes to Solar Grade Silicon. 6 Bulk Crystal Growth and Wafering for PV (Hugo Rodriguez, Ismael Guerrero, Wolfgang Koch, Arthur L. Endros, Dieter Franke, Christian Haßler, Juris P. Kalejs and H. J. Moller). 6.5 Silicon Ribbon and Foil Production. 6.6 Numerical Simulations of Crystal Growth Techniques. 7 Crystalline Silicon Solar Cells and Modules (Ignacio Tobıas, Carlos del Ca˜nizo and Jesus Alonso). 7.2 Crystalline Silicon as a Photovoltaic Material. 7.3 Crystalline Silicon Solar Cells. 7.5 Variations to the Basic Process. 7.7 Crystalline Silicon Photovoltaic Modules. 7.8 Electrical and Optical Performance of Modules. 7.9 Field Performance of Modules. 8 High-efficiency III–V Multijunction Solar Cells (D. J. Friedman, J. M. Olson and Sarah Kurtz). 8.3 Physics of III–V Multijunction and Single-junction Solar Cells. 8.5 Computation of Series-connected Device Performance. 8.6 Materials Issues Related to GaInP/GaAs/Ge Solar Cells. 8.7 Epilayer Characterization and Other Diagnostic Techniques. 9 Space Solar Cells and Arrays (Sheila Bailey and Ryne Raffaelle). 9.1 The History of Space Solar Cells. 9.2 The Challenge for Space Solar Cells. 9.6 Future Cell and Array Possibilities. 9.7 Power System Figures of Merit. 10 Photovoltaic Concentrators (Gabriel Sala and Ignacio Anton). 10.1 What is the Aim of Photovoltaic Concentration and What Does it Do? 10.2 Objectives, Limitations and Opportunities. 10.3 Typical Concentrators: an Attempt at Classification. 10.4 Concentration Optics: Thermodynamic Limits. 10.5 Factors of Merit for Concentrators in Relation to the Optics. 10.6 Photovoltaic Concentration Modules and Assemblies. 10.7 Tracking for Concentrator Systems. 10.8 Measurements of Cells, Modules and Photovoltaic Systems in Concentration. 11 Crystalline Silicon Thin-Film Solar Cells via High-temperature and Intermediate-temperature Approaches (Armin G. Aberle and Per I. Widenborg). 11.4 Crystalline Silicon Thin-Film Solar Cells on Intermediate-T Foreign Supporting Materials. 12 Amorphous Silicon-based Solar Cells (Eric A. Schiff, Steven Hegedus and Xunming Deng). 12.2 Atomic and Electronic Structure of Hydrogenated Amorphous Silicon. 12.4 Understanding a-Si pin Cells. 12.7 Conclusions and Future Projections. 13 Cu(InGa)Se2 Solar Cells (William N. Shafarman, Susanne Siebentritt and Lars Stolt). 13.4 Junction and Device Formation. 14 Cadmium Telluride Solar Cells (Brian E. McCandless and James R. Sites). 14.5 CdTe Thin Film Solar Cells. 14.7 Future of CdTe-based Solar Cells. 15 Dye-sensitized Solar Cells (Kohjiro Hara and Shogo Mori). 15.2 Operating Mechanism of DSSC. 15.4 Performance of Highly Efficient DSSCs. 16 Sunlight Energy Conversion Via Organics (Sam-Shajing Sun and Hugh O'Neill). 16.1 Principles of Organic and Polymeric Photovoltaics. 16.2 Evolution and Types of Organic and Polymeric Solar Cells. 16.3 Organic and Polymeric Solar Cell Fabrication and Characterization. 16.4 Natural Photosynthetic Sunlight Energy Conversion Systems. 16.8 Summary and Future Perspectives. 17 Transparent Conducting Oxides for Photovoltaics (Alan E. Delahoy and Sheyu Guo). 17.4 TCO Theory and Modeling: Electrical and Optical Properties and their Impact on Module Performance. 17.5 Principal Materials and Issues for Thin Film and Wafer-based PV. 17.7 Measurements and Characterization Methods. 17.9 Recent Developments and Prospects. 18 Measurement and Characterization of Solar Cells and Modules (Keith Emery). 18.5 Module Qualification and Certification. 19 PV Systems (Charles M. Whitaker, Timothy U. Townsend, Anat Razon, Raymond M. Hudson and Xavier Vallve). 19.1 Introduction: There is gold at the end of the rainbow. 19.10 Removal, Recycling and Remediation. 20 Electrochemical Storage for Photovoltaics (Dirk Uwe Sauer). 20.2 General Concept of Electrochemical Batteries. 20.3 Typical Operation Conditions of Batteries in PV Applications. 20.4 Secondary Electrochemical Accumulators with Internal Storage. 20.5 Secondary Electrochemical Battery Systems with External Storage. 20.6 Investment and Lifetime Cost Considerations. 21 Power Conditioning for Photovoltaic Power Systems (Heribert Schmidt, Bruno Burger and Jurgen Schmid). 21.1 Charge Controllers and Monitoring Systems for Batteries in PV Power Systems. 22 Energy Collected and Delivered by PV Modules (Eduardo Lorenzo). 22.2 Movement between Sun and Earth. 22.4 Solar Radiation Data and Uncertainty. 22.5 Radiation on Inclined Surfaces. 22.6 Diurnal Variations of the Ambient Temperature. 22.7 Effects of the Angle of Incidence and of Dirt. 22.9 Irradiation on Most Widely Studied Surfaces. 22.10 PV Generator Behaviour Under Real Operation Conditions. 22.11 Reliability and Sizing of Stand-alone PV Systems. 22.12 The Case of Solar Home Systems. 22.13 Energy Yield of Grid-connected PV Systems. 23 PV in Architecture (Tjerk H. Reijenga and Henk F. Kaan). 23.4 Steps in the Design Process with PV. 24 Photovoltaics and Development (Jorge M. Huacuz, Jaime Agredano and Lalith Gunaratne). 24.2 Breaking the Chains of Underdevelopment. 24.4 Examples of PV Rural Electrification. 24.5 Toward a New Paradigm for Rural Electrification.